Advertise your company details and business logo on our Personalised post-it notes and stay advertised. Just choose which ones you like the best and we'll see to all the rest. Advertise your details on our personalised post-it notes today, your customers will be delighted at this practical gift, sticking your details all over their work place for all to see. To find out more about our Personalised post-it notes click here and fill in the contact form and we'll get straight back to you. 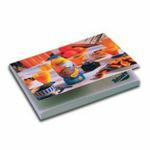 We have lots more promotional and personalised items here at Calendar Lady Promotions besides our Personalised post-it notes click here for our full A-Z list.